What is an aspiring little chef without a kitchen to call their own? The Melissa and Doug Cook's Corner Wooden Kitchen from Today’s Concept offers an imaginative afternoon of play for your child. Sturdy construction features a wooden play stove, play oven, and storage cabinet. Real clicking knobs and a play sink may the experience that more realistic. Your child is going to love this set for years to come! For an added chef’s experience, consider including other Melissa and Doug wooden play food products for your child. The Melissa and Doug Cook's Corner Wooden Kitchen from Today’s Concept also makes a great gift idea! A make believe dream kitchen that will fit in your house too! 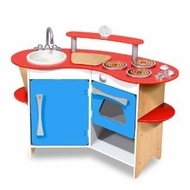 The cooks corner kitchen includes a pretend stove, oven and sink with drawer storage. It features a working kitchen timer and clicking knobs for the stove and oven. It is approximately 37" x 29" x16" assembled. Assembly is required. Ages 3+ Food and cooking utensils are sold separately.